No Nukes Action Committee invites an anti-nukes activist Ms. Chieko Shiina from Fukushima to tour California. Join us and draw a big map without nukes! Inviting Ms. Chieko Shiina will be the next crucial step to advance this already established international coalition into California-state or even national level organizing because she is one of the most powerful organizers from Fukushima. Being a youth activist in famers’ and students’ organizing for land issues and fight against US-Japan Peace treaty, she is an experienced activist who understands the mechanism and the legacy of nuclear renaissance in relation to multinational militaries in the context of East Asian politics. She was an organic farmer in Kawamata town of Fukushima. 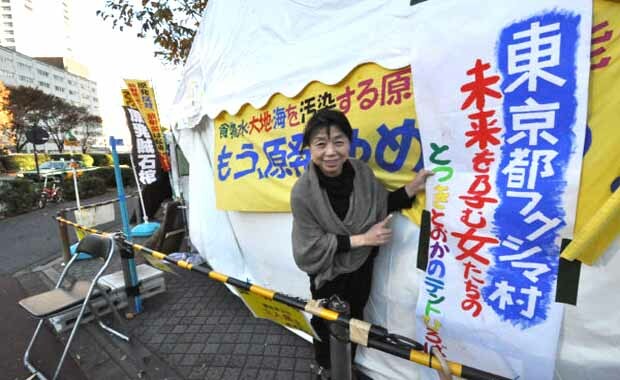 She became anti-nukes organizer since March 11th, formed Fukushima Women Against Nuclear Power, touring communities all over Japan to help support local organizing against nukes. She organized the sit-in in front of the Ministry of Economy and Industry from September 11th, 2011. She coordinated women from Fukushima to set up “Women’s 10 months and 10 days sit-in” in October, which later became both a symbolic and physical space where women from all over Japan came to communicate and organize. This is also now known as Occupy Kasumigaseki, Tokyo, which Occupy Berkeley group allies with. Support us with coordination of the tour + donation! Fukushima Update: Special Visitor from Fukushima! Co-Sponsor: The Peace and Resouce Center of San Diego, San Diego Veterans for Peace, Women Occupy San Diego. This event is free of charge. Your donation to Chieko Shiina and her tour will be appreciated. イベント名: Fukushima Update: Special Visitor from Fukushima! I’d like to retweet this site. I noticed one error, it should be “Tuesday, July 10th”. It says Friday, July 10th. Please correct.